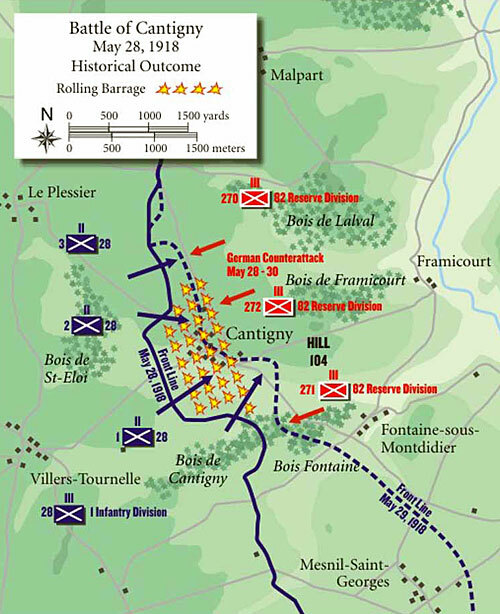 Appropriate that on this Memorial Day we remember the first victory of US troops in World War I: the battle of Cantigny fought a century ago. A relatively minor affair compared to the fighting that would come later in the year, the Americans of the First Division, the Big Red One, acquitted themselves well in their first battle. 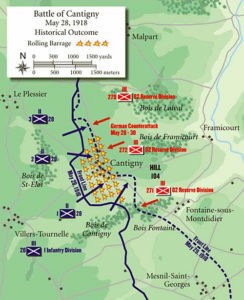 Behind a rolling barrage supplied by the French, the men of the 28th Infantry regiment, supported by the 15th Infantry regiment, took the village of Cantigny from the 18th German Army in the early morning hours of May 28th and held it against three days of German counterattacks. Casualties were about 1600 on each side, with the Yanks taking 250 prisoners. The citizen soldiers of the AEF had demonstrated that they could fight and win, and now it was merely a question of whether they would arrive in time to reverse the momentum the Germans were trying to build with their offensives in France.